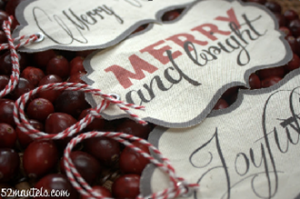 FREE Printable Fabric Gift Tags! 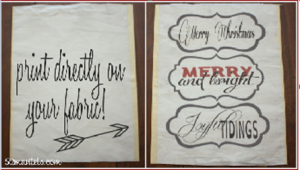 You are here: Home / Holidays / Making A Merry Christmas / FREE Printable Fabric Gift Tags! 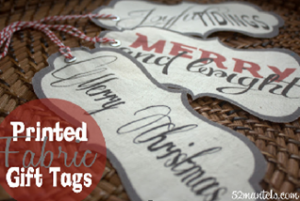 I’m so excited to share my tutorial for Printed Fabric Gift Tags with FREE Christmas Tag Template! I just love beautifully wrapped Christmas presents under the tree, don’t you? It’s so fun to go shopping each year and pick out the perfect wrapping paper and embellishments. Over the years, I’ve found that as Christmas gets closer, I have less time to spend wrapping my gifts. That’s why I like to start the season out with a nice stash of pretty tags and accessories so I can quickly put beautiful packages under the tree! And, bonus, these tags are made of a sturdy canvas fabric, so you’ll probably get several years of use out of them! I started this project by creating a printable set of tags. Of course, I’d be happy to share that template (included below) with you! Or, you can create your own custom tag. Once you get your canvas set up, you can print anything you’d like on it! After you’ve readied your file for printing, grab a sheet of 8.5×11″ cardstock to help guide your fabric. Cut your canvas fabric down to 8.5×1 inches. 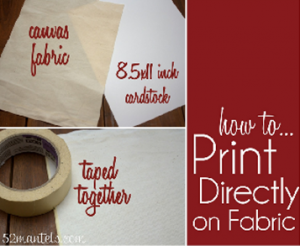 Use the masking tape to attach the canvas fabric to the cardstock. You’ll only need to tape down the two long sides, but be careful not to tape into your printing area. When your canvas is ready for printing, feed it directly into your printer like you would regular printer paper. Make sure you know which way your printer prints, for instance, my printer requires me to insert the sheet canvas-side up. When your tags are printed on the canvas sheet, remove the tape and cut around the outside line of the tags. To each of my tags, I added a 3/16 mm eyelet with an eyelet setter from my local craft store (both found in the scrapbooking section). Alternately, you could attach the tags to your packages with decorated clothespins! 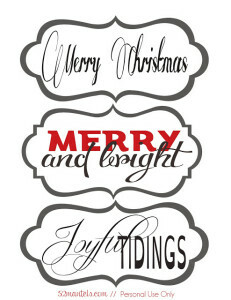 I think these printed fabric tags turned out so cute and I can’t wait to see them under my Christmas tree! I may even whip up a bunch more to use ON my tree! Feel free to use my tag template for your own printed fabric tags! Just right click the above image and save it to your computer.